Now you can be a gun less gunman thanks to this costume t-shirt. 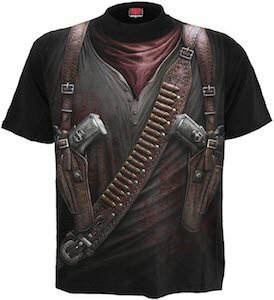 The costume t-shirt is printed on both the front and the back and shows holsters with two guns on the front and a whole lot of bullets and on the back, there is a knife also in a holster. A t-shirt like this may not be friendly but it sure makes you look like a gunman and if that is the look you want then this is the shirt. Halloween or other dress-up occasions work great by simply wearing this t-shirt and it is available in men’s sizes Medium – XL and it is made of 100% cotton. It doesn’t have to be Halloween to wear this hilarious men’s t-shirt out and about. 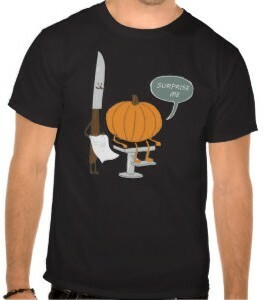 This t-shirt features a knife as a barber and a pumpkin in the chair as the person looking for a hair cut. He has no facial carvings and is asking the knife to “Surprise me”. 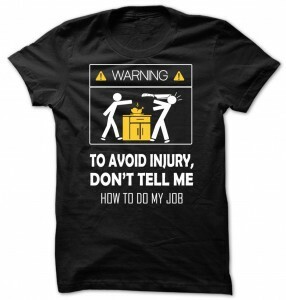 This t-shirt is sure to get a giggle out of the ladies. There are numerous colors and sizes available for this men’s t-shirt. It is 100% cotton that has been pre-shrunk. The bottom hem and sleeve hems have been double stitched to create a longer lasting t-shirt. Make sure prior to the Halloween season, your next t-shirt purchase is the Surprise me! Halloween Pumpkin T-Shirt.